Skin problems come in many forms. The most common seem to be wrinkles, stretch marks, and acne scarring. If any of these is an issue for you, then you might have already looked into laser treatments, chemical peels, or other skin care procedures to help you. Each is well known and comes with high risks and side effects. Have you heard of microneedling or how it can help your skin issues? Microneedling, also called Collagen Induction Therapy, is a procedure in which clusters of micro sized sterile needles are pressed into the skin to penetrate down into the dermal layer of skin. The skin cells react by generating new collagen to fill out and stimulate healing. There are two main types of microneedling - stamping and rollers. Stamping is done with a cluster of needles that are pressed against the skin in small areas that require more precision. A Dermaroller uses a barrel-like head with the needles attached and is rolled across the area to be treated. Both are the same treatment, just different delivery. While the Dermaroller stimulates healing in the skin, it is not all it can do. The needles create micro-channels in the skin down to the dermal layer. Immediately after using the Dermaroller, serums containing essential nutrients for your skin are applied and will be entirely absorbed into the dermal layer. This increases the rejuvenating and healing results in this treatment. What type of serum is used depends on which issue you are being treated for such as wrinkles, stretchmarks, or scars. 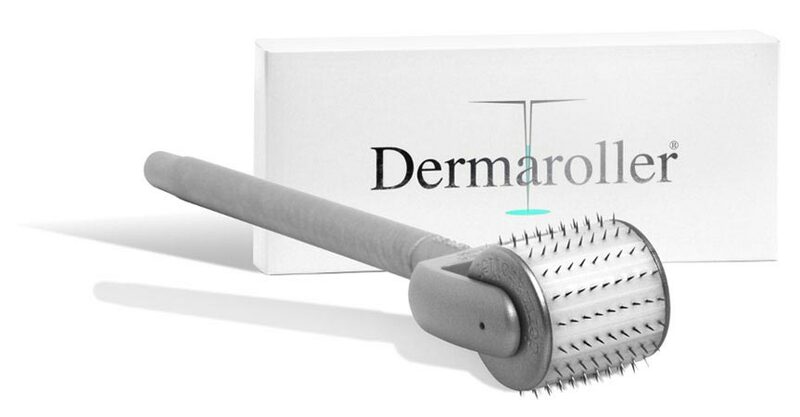 Using a Dermaroller does not damage the outermost layer of skin (epidermis). It penetrates through the surface to remodel the cells in the next layer. Because it leaves the surface intact, you don't need to worry about infections like you would with abrasive skin resurfacing techniques. Where other treatments may leave you hiding from society for a bit until your skin stops looking like a sunburn, at most your skin might be a bit red or swollen for a day or two. The most frequent question asked before any treatment is always how much pain is involved. The answer would depend on a couple factors. If using the Dermaroller with the shortest needles, it will only give an odd sensation as the needles brush across the surface of your skin. A deeper treatment requires longer needles and deeper penetration, which can cause mild pain for some patients, especially those with a low tolerance for pain. Your technician can easily apply a numbing agent to the skin in advance of the procedure to make it less uncomfortable. Chemical peels and other abrasive treatments do provide effective results once they heal. Those of you who have used aesthetic equipment before know that the major drawbacks to those kinds of procedures are the expense, the recovery time, the pain, and the high risks and side effects. Using the Dermaroller provides wonderful results without all of the problems and you can repeat the procedure until you reach the results you are looking for. It's worth the results. Interesting product... I've never heard of it before. You haven't state the price, but I bet it's expensive. I'm always a bit worried about these, especially if they come from a different country, they might be clean. I don't think I have ever heard of this process before. It does sound quite interesting. I wonder if it hurts? I've heard a lot about these contraptions, but wouldn.t do it on myself to be honest.. Sounds intriguing, I'd be interested in more detail about what can be achieved. Oooh it's looks scary!!! Thankfully I have been blessed with my Mum's good skin genes and I really hope that my children have inherited it too as my Hubby had terrible acne as a teen. I guess time will tell and treatments will have moved on even further by then. Dermaroller sounds very interesting, although I am not sure I am brave enough to try it. It might not even be safe to be used with rosacea. The principles behind it appear sound. It's like when you have to break down knots in muscles to fix back / shoulder problems. You have to cause a little damage to get the body to repair itself. It's an interesting idea, not sure it's something I'd go for though! Informative post. I've tried micro needling for my acne scars and it has helped me a lot. this is really interesting but I have super sensitive skin so I think i'll steer clear! This looks and sounds like such an interesting product. Certainly an interesting looking product but I don't think I'd be brave enough to try it out. This sounds interesting but I expect it's quite expensive. I would love to give it a go. It looks evil with those spikes! But I do hear good things about them, but not sure about the swollen face either. It looks scary, so it is reassuring to hear there isnt too much pain involved! If I was to choose between a dermaroller or a chemical peel the derma roller would win everytime. I have never heard of this before and if I am being honest with you I really don't like the thought of having this done. Something about putting holes, no matter have small I just don't fancy doing. But I wouldn't consider cosmetic procedures anyway. Sure it will appeal to some though.